We set out the stages of commissioning work to guide you through the process. Although this is largely tailored to headstones, the same principles apply to all of our work. Conversation flows. 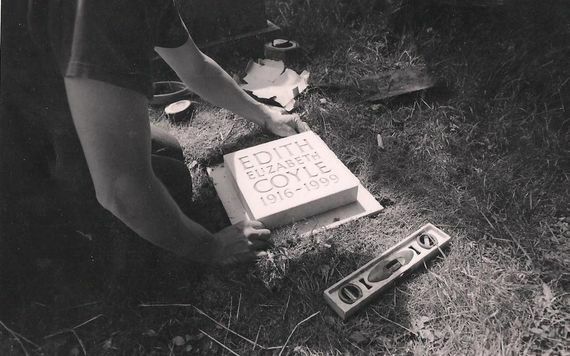 The best ideas for wording for the headstone comes through talking and learning more about the person the stone is to commemorate. Seeing the quality of the work up close. There are always many very different projects on the go. This can also spark inspiration. Guidance. Fergus can help with the wording and suggest alternatives. He works very closely with you to ensure these decisions are not rushed, but are gradual and deliberate choices. 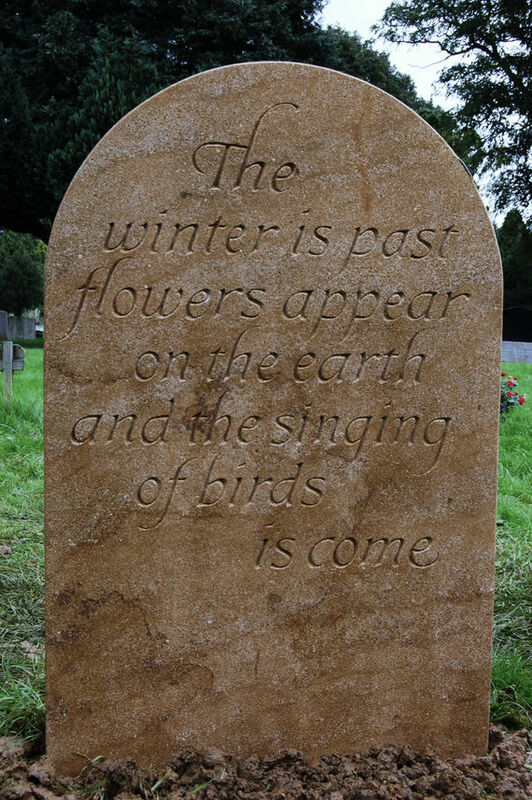 Read more on epitaph ideas. It is teamwork and the more Fergus can try and visualise your wishes the better the stone will be. Materials. A chance to touch and discuss the various stone types that can be used. Before you come it is always worth obtaining some knowledge of the churchyard or cemetery regulations. If it is difficult however we can approach the authorities for you. If you have any sketches or ideas for the inscription please bring them with you, even if they are only a start. Please also let us know if you have any deadlines in mind and the location of the stone. Type of stone. By now the decision will have been made about the material. At this stage we will be contacting our supplier or a quarry to check the availability and timing. Dimensions. 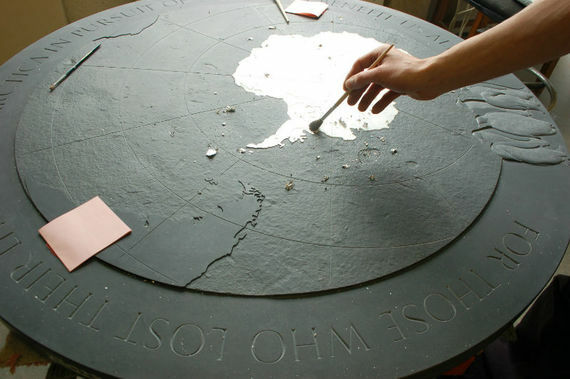 The height of the stone will be discussed and decided during the visit to the workshop, although of course it is not too late to change your mind at this stage. The width of the stone will be dependent on the longest line of the inscription. It is vital that the dimensions are decided after the layout has been designed. Shape. 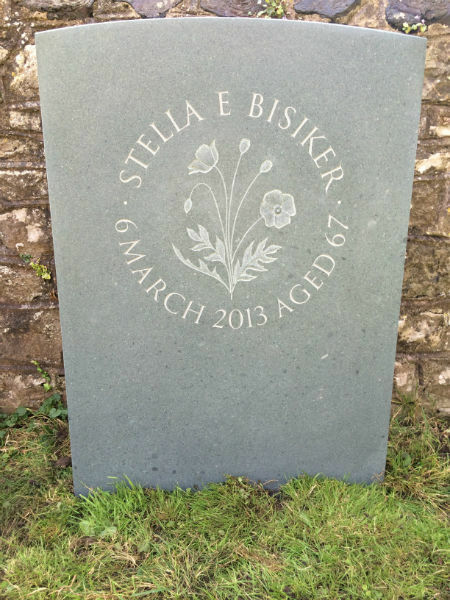 We can make any shape for the top of the headstone. Some are formal, some traditional. The best are often the simplest. 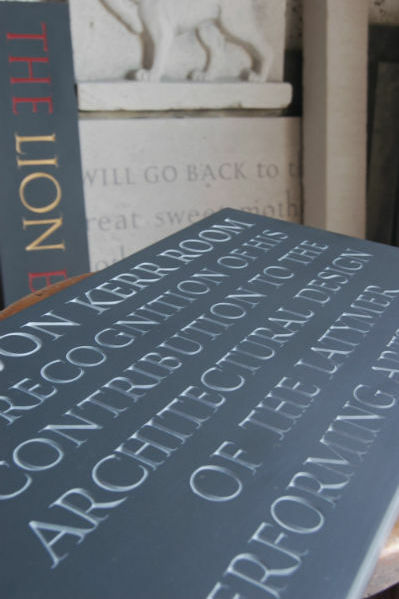 More often than not however it is best to design the inscription first and then look at which shape would suit the layout. Letterforms. Although we do not have any set templates for the letters, we do have a workshop capital (based on the roman Trajan letterform), a roman lowercase and italic. 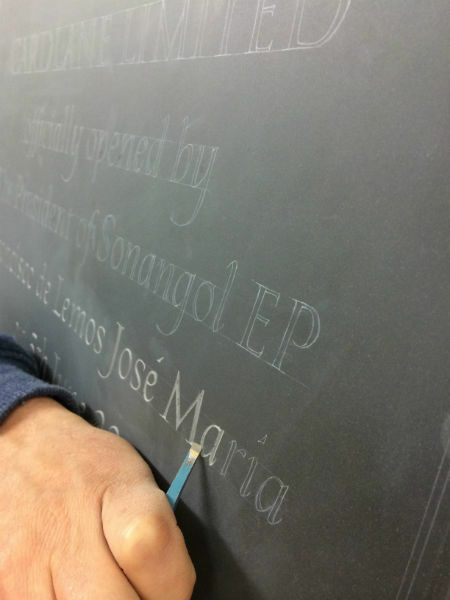 This is important if there is more than one person working on an inscription; it ensures consistency. This said, sometimes there might be a particular face that is required or something more unusual involving ligatures or nesting letters. Recently an inscription we were asked to carve needed to be Egyptian hieroglyphs. For this we teamed up with an Egyptologist at the British museum to ensure they were absolutely correct! Character. 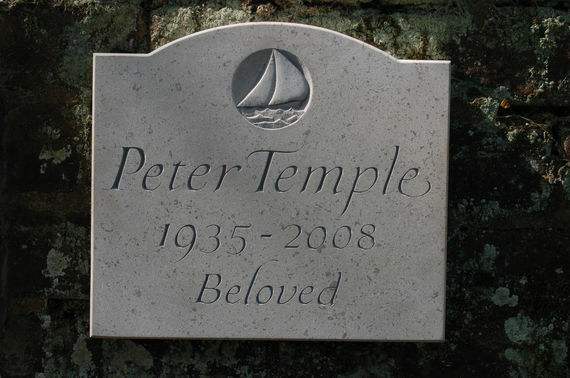 Often the headstone will need a formal feel, sometimes contemporary. A feminine feel is often requested. This is all fine, but whatever we do, it is essential the character is timeless and doesn't appear dated in 20 years' time. Trends are best avoided. Carvings. 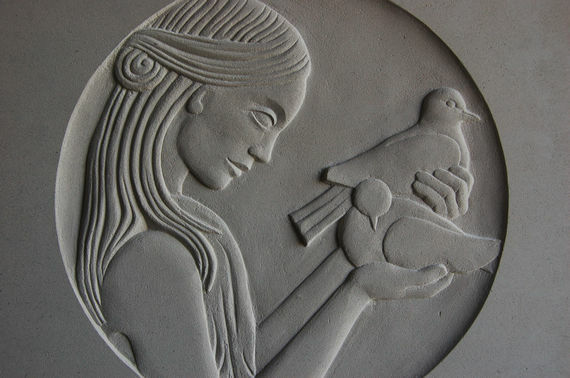 Quite often there is room for a carving of a symbol or design that means something special to the person who died. 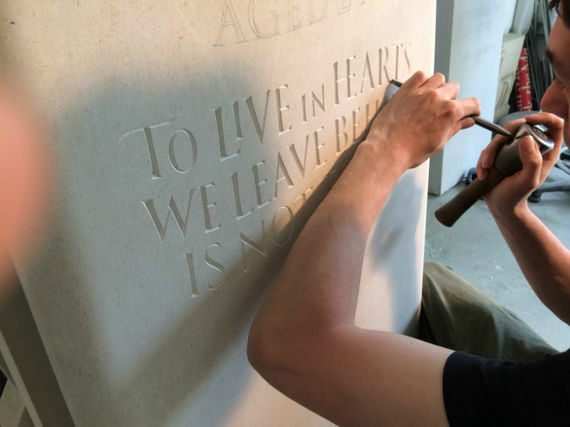 Almost anything that can be drawn onto paper can be transferred to stone, but we would have to make sure the carving was suitable for the type of stone chosen. 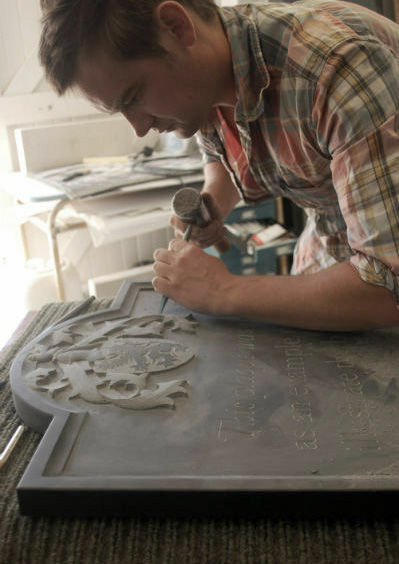 Read more on ideas for gravestone symbols and carvings. A covering letter will be sent with the design which can be posted or emailed. The letter will contain the essentials outlining timing, cost, cemetery fees and terms. Permission for a headstone is always required. If the grave is in a churchyard, the local Diocese will have regulations on size and often wording. A cemetery will be concerned with dimensions and health and safety. Once the design has been approved, we will seek permission on your behalf. The nationwide fee for erecting a headstone in a churchyard is £121, although this changes every year. Council run cemeteries have different fees; usually around £200. The application will be completed by us then sent on to you for signing before sending it on with a cheque for the fee. The go ahead can take up to three weeks to get processed. If we work within the regulations, the application is always approved. If something unusual is called for we may have to seek permission from the higher authority, but this takes time, it's expensive and here is no guarantee it'll be approved. Having said that, because our designs are so well thought out, they tend to be approved. Most of the materials we use are from British quarries, however we stopped using the quarry directly many years ago. This is because we are a small company and there is no certainty that we would be supplied with the very best. We now have now a brilliant supplier who knows our quality of work and appreciates the need for the finest stone and slate. We give him the exact specifications for a particular job. 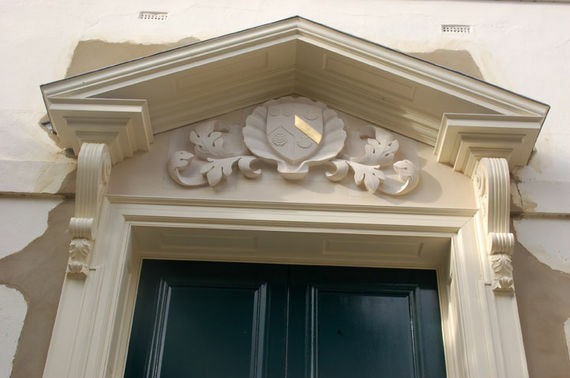 Most of the masoning is done by hand ensuring a beautiful and breathtaking finish. This is the point when the lettering comes alive. We do not make a full size drawing on paper and trace it on. 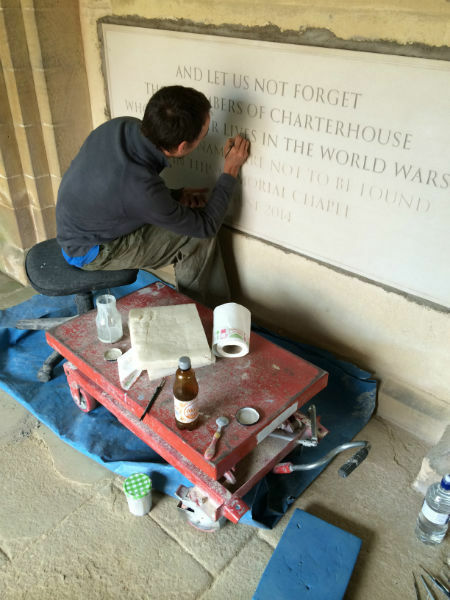 Instead the words are pencilled directly onto the stone. 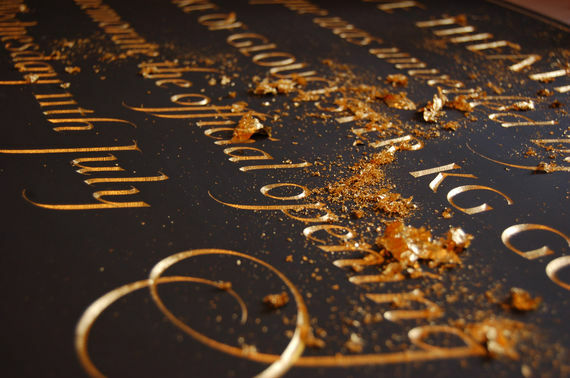 Every time we draw out an inscription it is an opportunity to improve it. This stage often takes longer than the actual carving. It has to be right because as soon as the chisel touches the stone is it too late to re-think. The drawing requires great discipline and if it's not quite right, we must be prepared to start again. 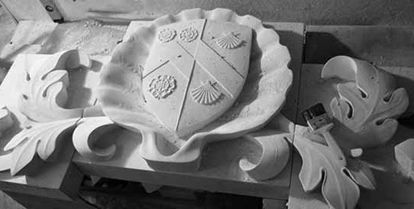 You are now invited to view the work so far, before any carving is under way. It offers the opportunity to make any final changes and usually a visit back to the workshop is worthwhile. If however distance is a restraining factor, we can post or email photographs. 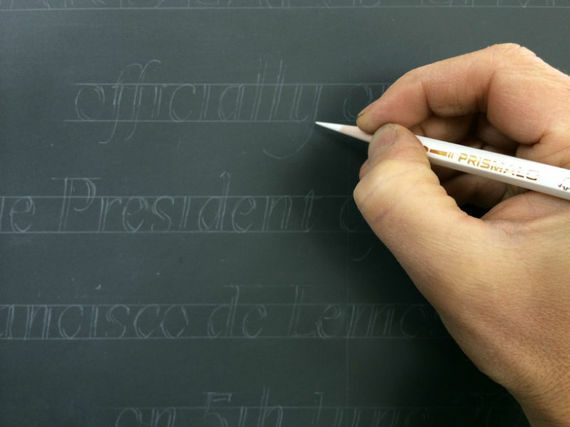 The final decisions with letter-spacing are made during the carving. At least three letters are roughed out then adapted if necessary to correct any minor spacing issues. 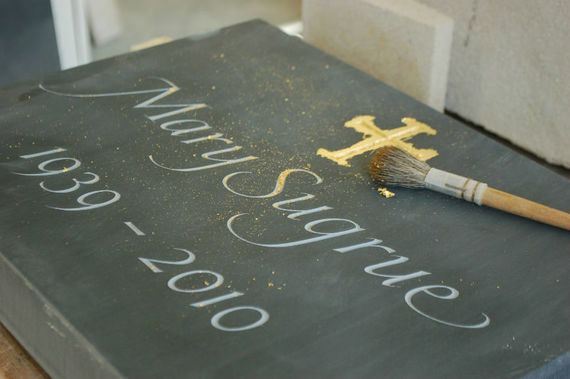 Sometimes on slate it is necessary to paint the lettering on slate, especially if the letters are small. To many this may sound wrong, but the paint is mixed up to match the colour of the cut; usually a light grey. The paint is matt in texture and lasts for at least 20 years, by which time the weathering process would have taken over. The painting is tastefully done and to most people looks very natural. This is one of the most important parts of the job. Many people seem surprised that we install all of our own work. But we think it's crucial that we finish the job whilst making sure it goes up level and scratch free. You are very welcome to come along and watch should you chose to. Many people however prefer to go and see the stone quietly afterwards. Monolith. 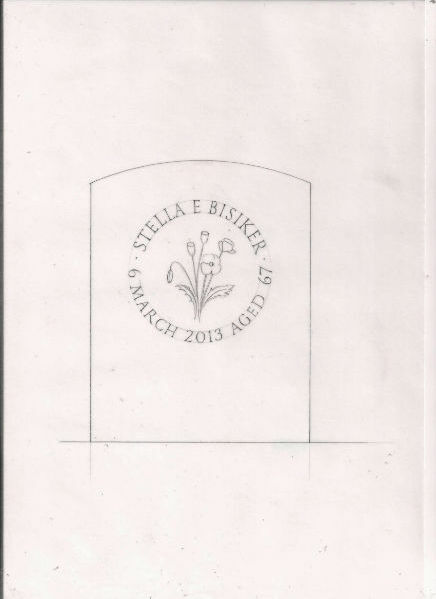 Most of the headstones we make are installed this way. It involves burying 25 - 30% of the total height underground, in other words, the stone rises directly out of the ground. This traditional method is much favoured by churchyards. The stone is set in a heavy concrete shoe about a foot below ground level. Base and dowel. 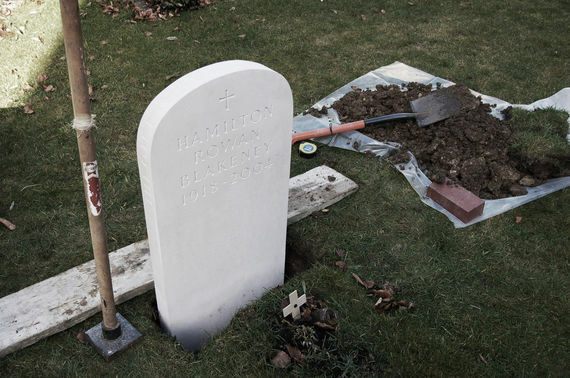 The headstone is drilled and resined to a base above ground level using stainless steel dowels.